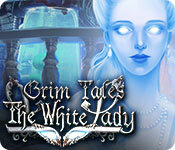 Grim Tales: The White Lady is rated 3.7 out of 5 by 14. Rated 5 out of 5 by biscuitsmama from GRAB DAD AND HURRY OFF TO DO A BIT OF GHOST BUSTING IN THIS LATEST GRIM TALES Anna Grey is back in yet another of the never-ending installments of the Grey family saga or the antics of their children in this case. Anna receives an urgent call from her nephew Brandon asking for her help because his son Billy has gone missing from the Evergreen Boarding School along with his school friend Sarah. When Anna rushes to the school she finds there has been a fire that has destroyed portions of the school but thankfully the children were evacuated, with the exception of Billy and Sarah who are still missing. 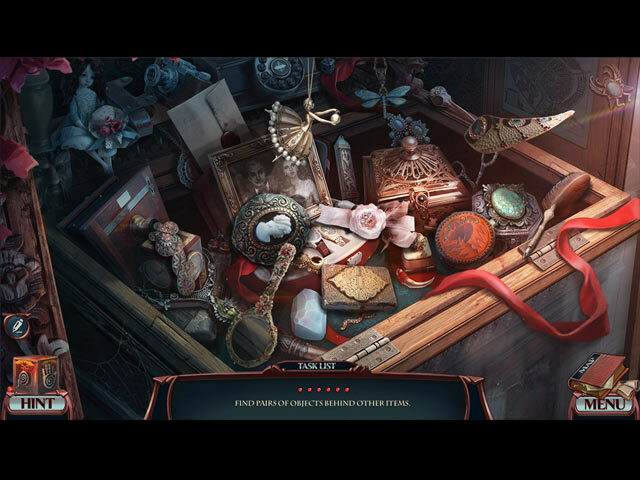 Will you be able to solve yet another mysterious case and save Billy and his friend from the White Lady? The technical aspects of the game are in line with those of other games from this developer, but the graphics are really very cartoonish with the exception of Richard who is well illustrated. As I played the game I kept feeling like I was in the pages of a comic book. Aside from the graphics that really put me off, the sound and voiceovers are generally okay. The game offers the custom mode with hints and skips that can be set in a range of 15 to 90 seconds as well as other options to set up the gameplay as you wish. There is an interactive map and you have a helper in the form of your dear old dad, Richard, or at least his skull to tag along on your inventory bar. The HOPS offered a variety of interactive scenes including list, silhouette, and matching types. The HOPS are interesting and sometimes items seem difficult to spot but the scenes are actually very good. Yes, the puzzles again are familiar but some have a different twist. 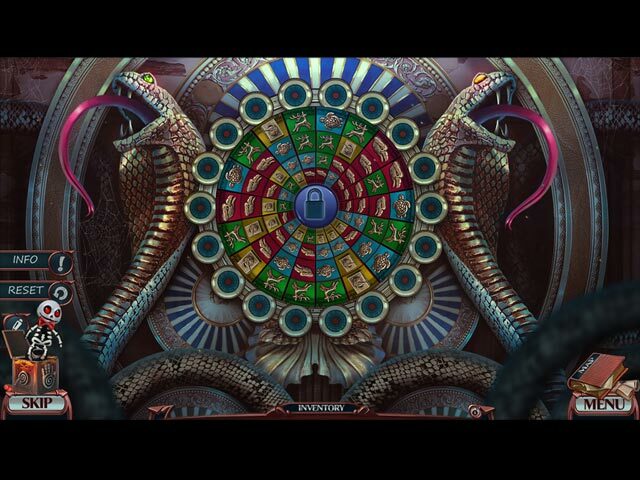 The puzzles in the early part of the game are easy but there is some challenge ahead. Although some seasoned players might find the puzzles very easy, overall I found them to be quite entertaining and fun to play. If you prefer the CE version of a game, this one includes two collectibles and morphing objects to find, achievements to earn and the other expected extras this developer includes in its CE games such as the Secret Room, replay of HOPS and Puzzles, a 40-page Strategy Guide, and the Bonus Chapter. Grim Tales: The White Lady is game number thirteen in this series. Honestly, I thought I had lost all interest in the Grey family storyline but I found that I rather enjoyed playing the full game. Yes, I dislike having Richard’s Skull tag along and really wish he would go away but he was helpful at times. In the end Grim Tales the White Lady turned out to be more than I expected and it was a nice surprise. I enjoyed the gameplay and the overall game was much more entertaining than I expected. As always, I recommend that you try the demo to see if The White Lady is a game you will enjoy. Happy gaming! Rated 4 out of 5 by denniann2 from it is a great game it is about being brought in to figure out what is happening in this school where 2 students are missing. you are trying to find the kids and there is a ghost helping you. it is the same premise as other grim tales games. Rated 4 out of 5 by rpggramma from One of my favorite series. I have most, if not all of these and they are very good. They always have everything that makes for a good game. Even though "daddy" is very helpful, (I do not know how he always have what I need) I wish he would go away. I really don't need a skull in my pocket! Other than that, games are always good and fun Enjoy! Rated 4 out of 5 by JulzCat from Anna and Skull Daddy To The Rescue (Again)! Poor Anna was just enjoying her glass of wine and ONCE AGAIN she has to go out and save her relatives. I enjoyed this game. It started out kind of slow, but it was a pretty lengthy game for an SE and I eventually got into it. I didn't even notice that the characters were less realistic until all the reviewers pointed it out. The reason I gave it four stars instead of the usual five is that the story line was familiar on more than one point. The whole "ghost in a boarding school with a young relative" game has already been done, as well as the "my father tried to kill me to gain immortality" theme. Perhaps Anna should take a break from her relatives and visit some haunted friends instead? There's a lot of stories you could come up with that involve her very cool abilities. I would also like to see more with her and her new husband. Let Anna have a little fun for once! Still, I thought it was a good game. Rated 4 out of 5 by Yanie1020 from Elephant is Doing Better I had quit playing games by Elephant because they were too easy and just didn't hold my attention. This one was much better, so I won't write off the Elephant developers yet. There was actually some challenge to it. I'll look forward to the next installment in this series. Rated 4 out of 5 by PATinPNS from Good Little Game with a Few Changes This is posted after completing the entire game. This is of course a sequel to the other grim tales games. I have to say other than the main characters and the theme, it is really different than the others. It was fun even with the ghosts. The graphics were quite a bit different from the other games. Rather than going for a realistic appearance, the designers used a cartoon format. It was something out of a comic book and if you forget about the others in this series, they are quite unique. Colors were rather bright, but dreary when necessary. Voice overs were well done and the music along with effects went along with the action. I did like the challenge. It was right up my alley. The mini games were not terribly challenging and could be completed without too much effort. I did skip a few, because I couldn't figure out what to do or they were repetitious in nature. Once is enough. With several degrees of difficulty available I chose the custom so I could set the skip and hint to the fastest speed. 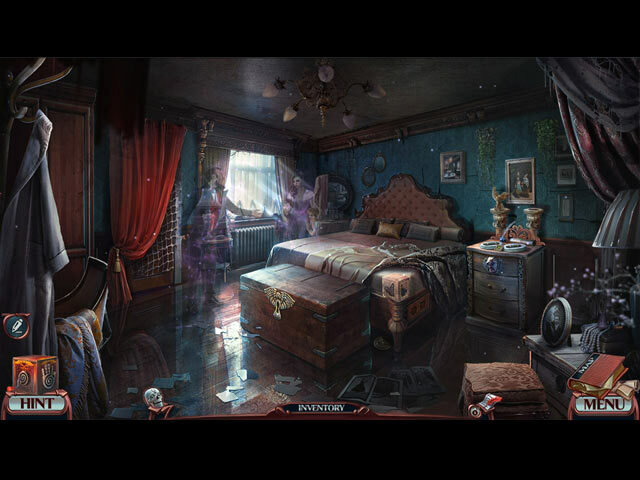 Hidden objects were silhouettes and lists with some interaction among them. Nice variation. Others will do the story line for you so I won't bore you with that. Richard is here as is Auntie who must search for Brandon... again. Poor kid needs a leash. Even though it is the same ghost theme that the developers seem to be stuck upon here lately, this one did keep my attention and wanting more. This is a good game and I invite you to try the demo and see what you think. Just forget about the past games and enjoy what this one has to offer. Rated 4 out of 5 by pennmom36 from UNIMAGINABLE FATE? I CAN IMAGE A LOT OF FATES! The review page blurb asks if I can save my nephew from an unimaginable fate, but I have a huge imagination! I haven't finished playing the entire game yet, but I did check out this Standard Edition version, midstream of the Collector's Edition version that I purchased. For me personally, I prefer the CE version, because I love Morphing Objects and collectibles, so if you don't care about those features, this version is perfectly fine. One thing I did notice (both versions) is that the children's characters are really cartoonish, and for the life of me, I can't understand why! I remember playing the beta version of Bloody Mary several years ago, and in one of the scenes, there as a class picture hanging on the wall, that required some type of interaction. On the survey afterwards, I asked why the picture of the children was so cartoonish and fake looking, when all the other characters and animals etc.were fantastically realistic. They actually did change the picture to look slightly more realistic, but it was still cartoonish and looked out of place, it was a photo, not a drawing by one of the kids. That's all worthless information, but after seeing those same cartoonish graphics again in The White Lady, I have to wonder why their graphics department still can't portrait more realistic, lifelike kids after 4 years! Other than that flaw, this is a great game, not the best Grim Tales, but a solid game with good entertainment value. Here's a recap of my review to help you decide which version, if any, is right for you: Aunt Anna to the rescue once again! Little Billy has disappeared yet again, this time, from the boarding school that was once the Evergreen Mansfield Mansion. Rumors of a ghostly apparition have spread throughout the school, shortly before Billy and his friend Sarah went missing. Could this be the Lady in White? Could this be the ghost of Laura Mansfield? The Grim Tales series is one of my favorite storylines, I own and have played all 12 previous games. Although The White Lady isn't one of the best games in the series, it's still an awesome game. The storyline in this game is just a little too familiar, and the HOP's are a bit dull, but the puzzles are in abundance to help even it out. I'm not sure why they chose to have Brandon's oldest son Billy, as the victim again, but perhaps the two storylines intertwine at some point in the story. In the Collector's Edition version, there are Collectible Emblems, Morphing Objects and Portraits that give a background history about various areas of the former Mansfield Mansion. Anna Gray is a Private Detective with a unique ability to travel back in time. All she needs is a personal item from the victim, and she's whisked away, back in time, before the tragedy occurred. This part is never fully explained and I have sooo many questions! Does Anna actually disappear when she time travels, or does she just stand there looking all weird? How does Anna always manage to time travel to the perfect time frame, does she ever go back too far or not far enough? If all she has to do is touch a personal item to initiate the time travel, how does she keep from time traveling when she touches other items, does she wear gloves? A trip to the grocery store or museum could be a nightmare for poor Anna! All questions aside, well, there is another unanswered question, does Anna take Daddy Richard's skull with her everywhere she goes, or does she just pop his skull into her purse, only when there's an investigation? As I stated earlier, the Hidden Object Scenes aren't very creative, but honestly, this is a feature that needs to either be phased out, or reverted back to the good ole days when objects were actually "hidden" Nowadays, the HO's are just huge junkpiles, or random cluttered items that in real life would make us look like hoarders. The objects are all in plain sight, not cleverly blended into a normal scene. The HO's in this demo are mostly Interactive List finds, but there are also Silhouetted Shape finds, and uncovering Pairs of identical objects. The Mini Games are entertaining, ranging from super simple to medium difficulty. Below are brief descriptions of some of the games you'll encounter during the demo: 1) Assemble a puzzle by correctly placing torn fragments. 2) Move all dowels through their corresponding holes using directional arrows on the dowels. 3) Use clue to enter the code on the panel. 4) Place sliders next to their corresponding images, sliders can only move clockwise along the tracks. 5) Complete the photo album pictures by placing the correct piece from the left and place on the right. 6) Hit the apple target by clicking when the sliders are within the green zone. 7) Light all the circles around the board by matching 3 or more identical tiles in a column to remove them. 8) Reconstruct a diary page by selecting a piece of the page and placing it in an adjacent empty space, pieces can't move over each other. 9) Use the clue shown to land on the correct symbols using left and right directional buttons to look through the different symbols. 10) Select directional arrows to move the character through the maze, searching for levers to open other parts of the maze. GRIM TALES GAMES AVAILABLE Title***Collector's Edition Release Date***Average Rating -Bloody Mary (8-1-13) 4.3 -Color of Fright (11-6-14) 3.8 -Crimson Hollow (8-25-16) 4.1 -Graywitch (2-2-17) 4.0 -The Bride (11-19-11) 3.8 -The Final Suspect (5-16-15) 3.8 -The Heir (2-25-16) 4.3 -The Legacy (1-5-12) 4.6 -The Stone Queen (1-3-13) 3.9 -The Vengeance (5-15-14) 4.5 -The White Lady (8-3-17) 3.9 -The Wishes (7-12-12) 4.5 -Threads of Destiny (10-7-15) 3.9 The Collector's Edition has 1 Screensaver, 8 Wallpapers, 8 Concept Art pictures, 5 Music Soundtracks 20 Achievements to earn, Archives, 36 Collectible Emblem pieces, Morphing Objects, 14 Portraits, a Secret Room, a built in Strategy Guide and a Bonus Chapter, enjoy! Rated 4 out of 5 by playinthewaves from Didn't feel very "Grim Tales" but was a decent stand-alone Other reviewers had really jumped all over this game when it came out as a Collector's Edition...I was hesitant to buy it with all of the mixed messages and waited until I had a coupon code to try it. I was both glad I bought the SE, and glad I ONLY bought the SE. Let me share some specific thoughts: The good: +Felt like a decent length game. This game kept me entertained through about 3.5 hours of gameplay with minimal interruptions throughout. There have been longer and better (oh, how I miss the old Blue Tea-run Dark Parables! ), but it was an OK length for an SE game, especially one I got from a bonus punch +Good cinematics, special effects, and voice acting. The bad: -Brutal change to "flat" art style. Grim Tales has previously had some of the most technically beautiful art I've ever seen. Has anyone on this (assuming mostly new?) dev team ever interacted with a child before? Not to mention seen one up close to draw. If their eyes were any wider I'd be calling ET and asking him to phone home and pick his wayward relatives up. Just felt like this artist needed more practice with figure drawing, to be honest. -Bleh storyline. The "twist" was cringe-worthy levels of obvious and slowly unlocking and exploring different rooms in this mansion-turned-boarding-school. -Meh characters, minus one. The characters had very little screentime and what was there was not enough to endear you to them (or have the opposite effect). Only cool character was your ghostly helper - possibly he's a kleptomaniac with how often he keeps appearing to give you inventory items, but he felt like the only cast member with any brain cells to rub together. His VA also did a great job acting him - he hits just the right "creep vs friendly" factor for "weird dead relative whose skull you carry around and talk to". Let's cap things off by saying this...I did enjoy the gameplay for the most part. Here's why I think people are upset, and maybe rightly so - this felt like a sudden scramble with a development team turnover, except it's a "trusted" series that people enjoy and anticipate. If this were a first game in a series of some brand-new indie developer we'd never heard of, I'd be pumped - there are things to improve upon but the gameplay is mostly solid. It's the fact that it is being marketed and sold with regurgitated characters who barely match their original counterparts that I think is upsetting people, and for all I try not to be negative and play each game as a stand-alone, I agree with other reviewers that it just doesn't hold up as strongly as other games in the series - something I think people have become sensitive to this year with some very lackluster deliveries in previously great series. Anyway, play the demo and make your own decision! I ultimately thought it was a decent game and worth the buy, but die-hard series fans will probably feel a little bit disappointed.